ABOARD QUANTUM of the SEAS – We’re on our final sea day and I have a few loose ends to tie up in my coverage of the Quantum experience, such as ways to spend the final day of the cruise. Certainly there are numerous activities less strenuous than skydiving and rock climbing that I’ve failed to mention. Reading in the library, playing cards, and there is surely a game of mah-jongg going on somewhere. Jewelry and art auctions and a chocolate sale are being held today. It’s also the last chance to win the Paradise Lotto Drawing. Unwinding in the Vitality SpaSM with a signature treatment is also a welcome option for adults. Today’s discount is a 75-minute massage for $149. My choice for something special was to go up in the North Star gondola for a bird’s eye view of the ship as it swept from side to side across the ship’s mid section. 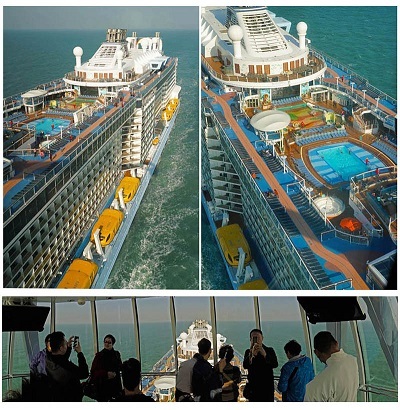 It’s a view that can only be witnessed on three Royal Caribbean ships. For some select passengers seeking serenity following a day on shore, there is The Solarium on the back of the ship. As the only non-open-air sun deck on the ship, the glass-enclosed Solarium lets tons of light in and is usually one of the warmest places on the ship (no wind chill). 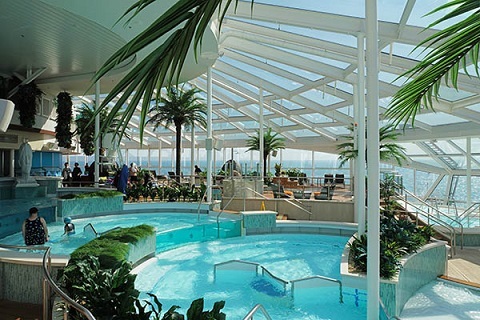 The Solarium on Quantum-class ships is also all the way forward providing better views. Note, however, that Solarium access is limited to suite guests in a Grand Suite or above on Quantum of the Seas. The Solarium varies by RCI ship, but typically is equipped with pampering units that include complimentary use of padded loungers, hot tubs, and wading pools in a calm setting. A bar and eatery is located here so you can spend the day among the peaceful oasis without leaving for a meal. The Solarium Bistro serves breakfast, lunch and dinner with a Mediterranean flair and breakfast is free of charge (lunch and dinner buffets are $32 per person plus gratuity). Which raises the question did we get enough good food on this ship? Originating from the Latin quantus, quantum is about quantity. 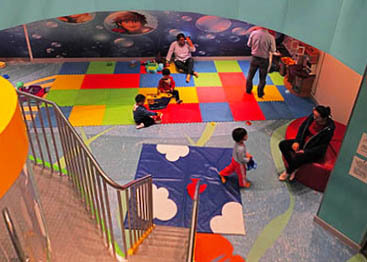 In this case it describes the variety of free dining options onboard Quantum of the Seas. Rather than have most passengers in a single dining room, Royal Caribbean separates them into four main dining rooms on the Quantum of the Seas in what they call Easy Dining. There are also a number of casual spots including an upper-deck Windjammer Marketplace that provides the standard buffet fare, and also a poolside grill. Additional fast food options range from quick-bite sandwiches, to pastries, pizza, and baseball style hot dogs. While not required, reservations are recommended for the four main dining rooms. 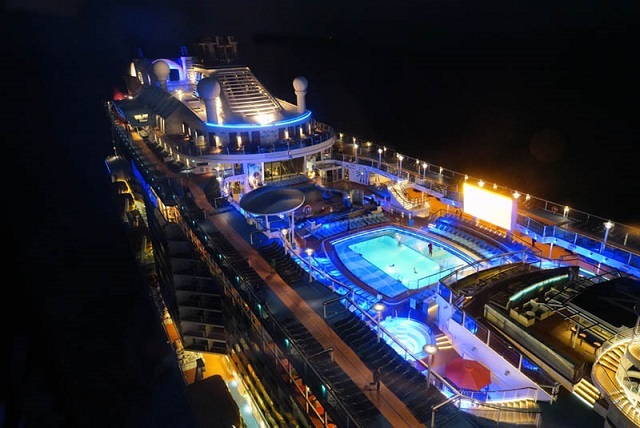 They can be made before the cruise online on the Royal Caribbean website, could also have been made ahead of time through a travel agent, or after getting onboard using the ship’s Royal iQ service. However, you can always be seated upon request, usually after a wait in line. The dress code in all restaurants is fairly casual. Shorts are not permitted in the formal restaurants but are not a problem for buffet and grill patrons. The quality at the four venues is generally quite good, from American comfort food to Asian fusion. I assume the specialty restaurants were even better as the ship’s staff attempted to upsell these on numerous occasions. Live stage shows generally required reservations in advance at the Royal Theatre, Music Hall, and Two70 Theatre, the most impressive of the three. 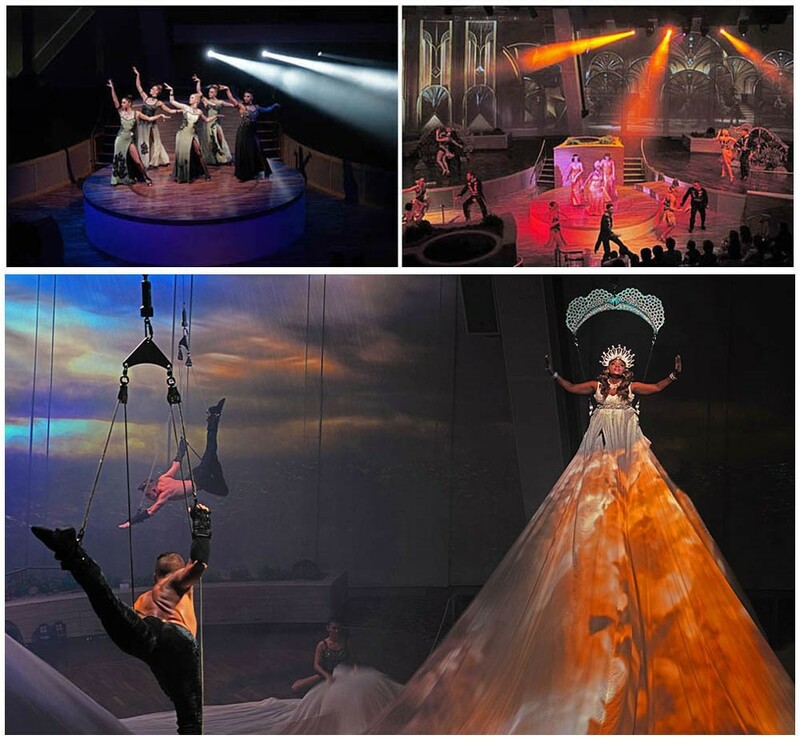 The most visually and technically spectacular show is at the Two70 Theater performed by StarWater. The cast of singers, dancers, and trapeze artists were brilliant although the logic of the storyline that “explores human emotion as our muse brings together the magic of the stars and the mysteries of the seas” was rather vague in my opinion. On the final evening, no reservation needed, we attended Scenic Odyssey, a percussion intense Broadway-type musical in the Royal Theatre. Being on this cruise has been like spending four days in China. 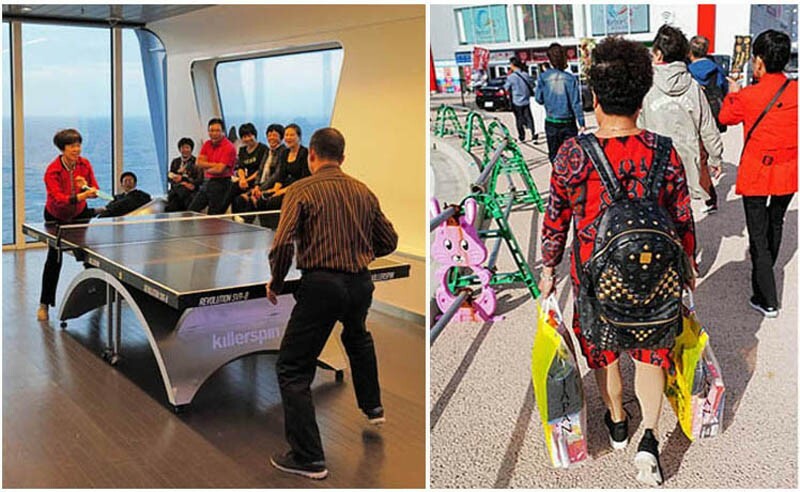 It was as though a cross section of the Chinese people of every age with all their traditions, customs, food preferences, consumer proclivities, leisure activities, et al, was lifted right on to the Quantum. As nearly the only da bizi (big nose, AKA foreigner) on the ship, I have received more service attention and enjoyed several privileges for the past four days. VIP express lanes have gotten Jialin and me past long lines and quickly into the Silk and American Icon Grill restaurants thanks to now being on a first name basis with headwaiters Onur from Turkey and William from Shandong, respectively. While service on the ship appears fairly efficient for most guests, there were times when being a foreigner (and a writer) was a huge benefit, such as when Ellen from Anhui escorted us past very long lines and quickly through Customs upon entering Japan. It was all very much like the way foreigners were given preferences and privileges in China two or three decades ago. I learned from one crewmember that a few more foreign (non-Chinese) passengers are generally on board for Quantum’s longer cruises. This likely includes foreigners working in China, but might also appeal to China visitors who would like to add a cruise to the end of two or three weeks of touring.